The mid-90’s was a new age for professional wrestling, after having a boom in the 1980’s due to Vince McMahon, Hulkamania, and Pay-Per-View. Things heated up for the WWF in the early 90’s, but, after the departure of Hulk Hogan in 1993, and with no discernible competition (WCW was growing, but was having issues of it’s own due to a revolving door of creative teams and talent) things were turning downward. WWF had cultivated newer (physically smaller) stars, such as Shawn Michaels and Bret Hart, but Vince McMahon always favored the mentality of having a larger man be the world champion. In late 94, Vince wanted the belt to go onto a man named Diesel (Kevin Nash). Bret Hart was the champion at the time, and I suspect that he played his political cards to get to not drop the belt to Diesel, who was admittedly not as talented as he. Things culminated in a feud with Bob Backlund, at Survivor Series 1994, where Hart faced Backlund in an “I quit” match which ended with Backlund sinching in the crossface chicken wing on Hart and having Owen Hart talk his elderly parents into throwing the towel in for Bret. Just days later, Backlund dropped the belt to Diesel at a house show in record time (8 seconds). Fast forward almost 15 years later, and Kevin Nash made a return at this past month’s Royal Rumble. I didn’t see it, but I saw pictures of it, and it was awesome! Wait . 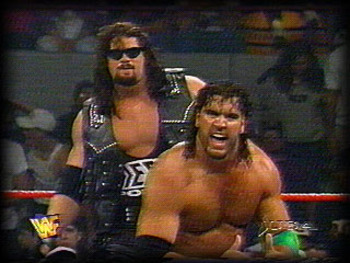 . . so if Kane is Diesel, then is Kevin Nash Dr. Issac Yankem? And if so, is he Scott Hall’s dentist as well?